Based on an article by Sharon Meyers, adapted by Katrina Murray. Photographs copyright Juhaim Parambil, Sharon Meyers, Monika Savier, Gudrun Waiditschka & Karsten Scherling. Qatar is a vibrant country that always casts a magical spell with its world-class museums, iconic architecture and magnificent Arabian horses. 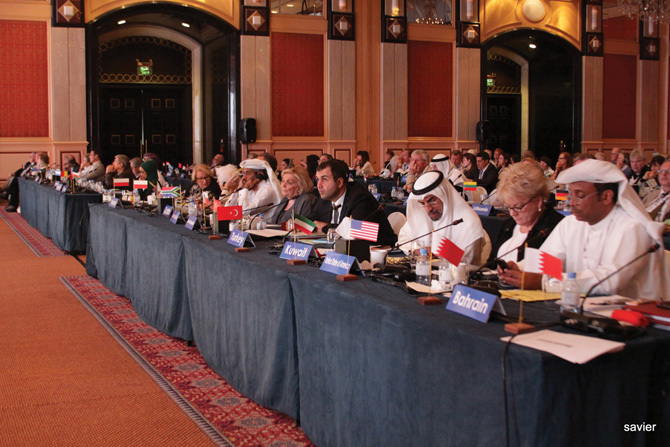 During November 2014 Arabian horse aficionados from around the world congregated at the elegant Ritz Carlton Hotel in Doha to attend the World Arabian Horse Organization (WAHO) Conference, held under the patronage of HH Sheikh Abdullah bin Khalifa Al Thani, Special Adviser to HH The Emir. Due to unforeseen circumstances preventing Brazil from holding the conference in 2013, the Qatar Racing & Equestrian Club (QREC) jumped into the breach to host the event for a second time in succession. 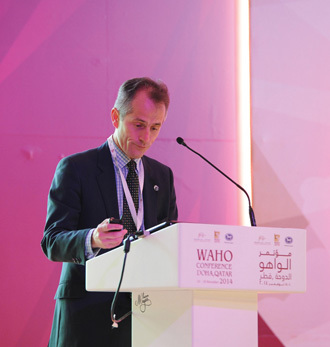 The central 3 days of the Conference included WAHO business, informative guest speakers, social events, Arabian racing and a visit to Al Shaqab Stud, member of the Qatar Foundation, plus a lavish farewell Gala Dinner hosted by the QREC. At this dinner everyone shared the same sentiment about the Conference: it had been productive, educational and a huge success. There then followed the exceptional Pride of Qatar Days. 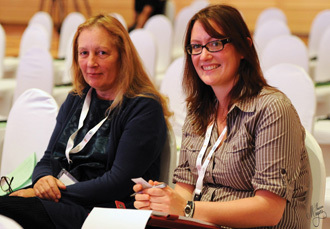 On the 2 days before the Conference started, the well attended WAHO World Registrars Meeting took place. This significant meeting over one and a half days, chaired by Mr. Xavier Guibert, was very busy and productive. The first afternoon was devoted to matters relating to the new European Union directives which directly affect studbooks and registries. The second day was mainly taken up with complex discussions on a number of proposed WAHO registration rule changes and updates. The contribution of those present was extremely important in ensuring that any such changes to our internationally accepted rules are appropriate and suitable for all WAHO Member registries to follow. The recommendations made by the Registrars Meeting were passed directly to the Executive Committee for their further discussion and decisions, and then presented to the floor of the General Assembly for vote of the members. All details can be found in the Conference booklet. 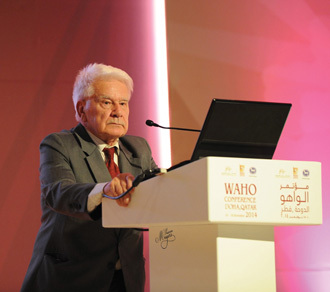 The packed schedule of events of the WAHO 2014 Qatar Conference itself began on the evening of 11th November, with a Welcome Reception and Dinner hosted by the QREC in the beautiful grounds of the Museum of Islamic Art. Mr. Sami Jassim Al Boenain, General Director of QREC welcomed us and it was a delightful evening under the stars. 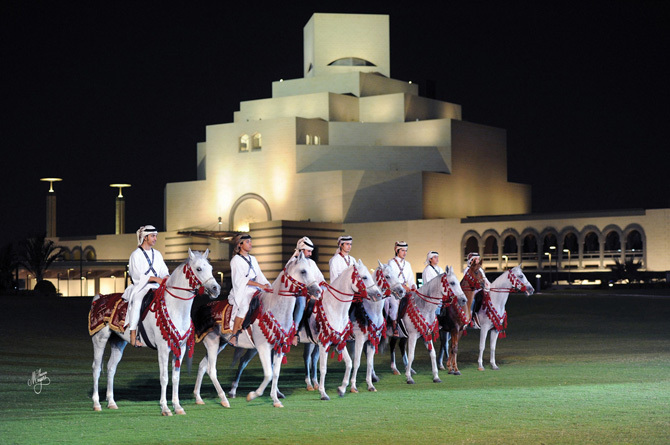 The highlight was a presentation of ridden Arabian horses in traditional saddlery, illuminated against the spectacular backdrop of the museum. This was truly an impressive start to the Conference. The following morning we all convened in the large ballroom at the Ritz-Carlton Hotel’s Conference centre. Here, in front of all the delegates and local VIP guests and many press reporters, the Conference was officially declared open by HE Sheikh Mohammed bin Faleh Al Thani, Chairman of the QREC. We were then shown an inspiring short film entitled “Heartbeat of Qatar” about the country’s Arabian horses. 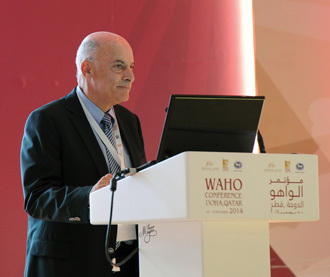 Recently elected President, Peter Pond’s opening speech which followed highlighted several of WAHO’s main achievements over the past 40 years and emphasised the strong bond and high level of cooperation between all WAHO member countries. 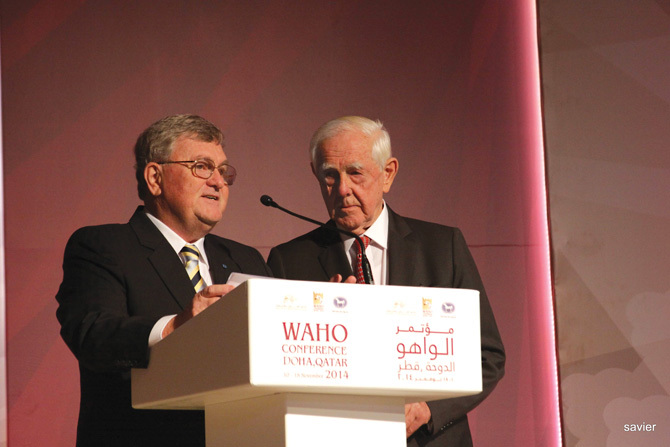 Peter then announced that Dr. Nagel had been awarded the honorary title of “President Emeritus” of WAHO. 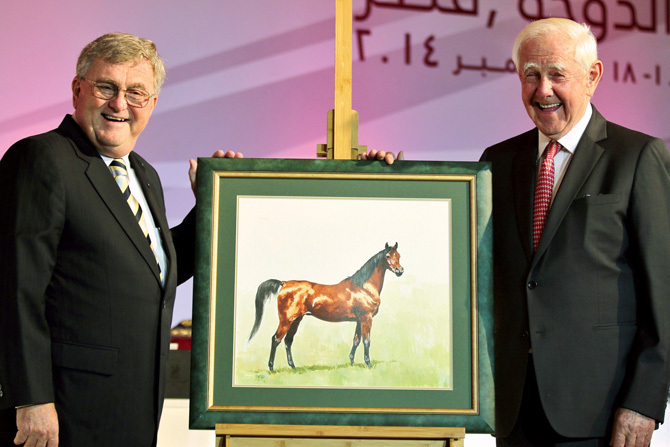 On behalf of the WAHO Executive Committee and WAHO Membership, Peter presented Dr. Nagel with a charming and a specially commissioned watercolour portrait of his legendary mare, Hanan, painted by Peter Upton. A minute’s silence was held in memory of those WAHO members who have passed away since the last Conference. Two new countries, Ecuador and Serbia, were warmly welcomed to full Registering Authority Membership, with their horses accepted into the WAHO Definition, having each completed all necessary requirements and published their first WAHO approved studbook. The main business of the WAHO General Assembly then followed over the next days, with the usual combination of agenda items, including the election of the Executive Committee Members, the presentation of the Treasurer’s Report, in which fee increases in all membership categories were announced, the Delegate reports, the Report from the World Registrars’ Meeting, discussions and votes on updates to WAHO rules, and information on WAHO activities and plans for the future. Requests were made from the delegates of Bahrain, Kuwait and the United Arab Emirates, echoed by Morocco, for consideration to be given to changes in the way the Executive Committee election is conducted. Peter Pond promised the delegates that this would be reviewed before the 2016 WAHO Conference. In his closing speech, Peter reminded us all of the importance of thinking ahead, and of the equal importance that WAHO places on our members: “It is self evident that all organizations must move with the times and keep a forward thinking attitude, and be prepared to adapt and change as need requires. Going forward, we need to be mindful from time to time of whether our Organization is still relevant, efficient and effective in the way our affairs are conducted. We must always keep these considerations in mind and I assure you that in our discussions the Executive Committee strive to do just that. We also commit ourselves to reporting those discussions to you as and when appropriate, and to asking for your feedback and input as much and as often as we can. To sum everything up. I sometimes hear people say “WAHO should do this” or “WAHO must do that” and I stop and I think to myself, “who, or what, actually is WAHO”. And my answer is simple. There are always interesting guest speakers at these events and this year several tackled the currently hot topic of horse welfare. The full text of all the talks, along with all the business of the meeting, is contained in the booklet of the Conference proceedings. Here we would just like to give you a flavour of the strength and depth of the various talks. Our first speaker was Cynthia Culbertson, a lifelong devotee of the Arabian horse with a particular passion for the breed’s history. She holds a degree in Near Eastern Languages and Literature and has lived and traveled extensively in the homelands of the Arabian horse. In Cynthia’s thought-provoking lecture “Bedouin Tradition and its Relevance Today” she viewed traditions in horse breeding through the earliest literary references of the Arabs. Early in the talk, she explained the differences between how we in the west now perceive our Arabian horses, and how they were perceived by their original breeders and caretakers for thousands of years: “I thought it might be fun to create a list of characteristics we all associate with the Arabian breed today. These include: Purity / Bloodlines, The Concave Profile or Dish, a Flat Topline, a Long Arched Neck, High Tail Carriage, Floating Trot, Large Eyes, Thin Skin, Large Nostrils, Good Disposition, Stamina. 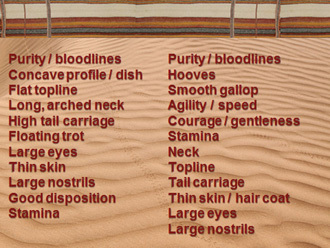 Not a complete list but most of the things we think about when we think of Arabian horses. You can see that I began with those characteristics that made up our artistic silhouette and those that we perhaps emphasize the most today. 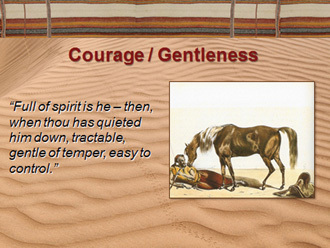 Cynthia further discussed the Bedouin tradition of never hitting horses, but only using words or gestures to train them, while reminding the audience that the Bedouin had one of the most successful horse cultures in human history using this philosophy. She then referred to the modern show world where the popularity of the “hard stand up” has promoted a culture of abuse. She asked the audience how they thought the Bedouin of centuries past would react if they observed a show horse today being presented. To emphasise this, Cynthia recited a poem she had written in the style of the pre-Islamic Bedouin poetry, but from the current perspective of a modern show trainer to his horse: Cynthia concluded, “Do we want this to be the ode to our champion Arabian horses? We hold countless centuries of tradition in our hands – tradition that gave us the oldest and purest breed of horse, beloved by countries and cultures around the globe. Tradition that tells us to respect and honour this noble horse. Is it not our most sacred task to respect this gift we have been given?” This statement was received with warm approval by the audience. 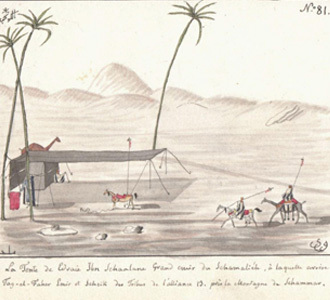 Professor Tadeusz Majda, a distinguished Orientalist and specialist in Islamic Art from the National Museum in Warsaw spoke about the treasured illustrated manuscript of Count Waclaw Seweryn Rzewuski (born 1785), a Polish explorer, orientalist, connoisseur and breeder of Arabian horses. 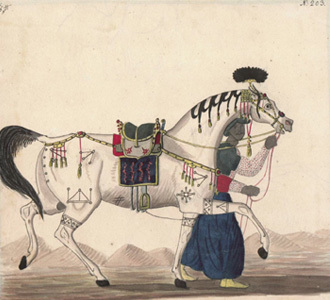 Count Rzewuski travelled into the Middle East to purchase Arabians for his own stud farm as well as for the stables of Tsar Alexander I and his sister Catherine, the Queen of Wurttemberg, and wrote extensively about his travels. On hearing more about this work from Professor Majda, many of those present were certainly looking forward to the publication date. “The manuscript by Waclaw Rzewuski is a unique piece from the literary perspective, bringing together the author’s autobiographical writings, reminiscences and notes and comments concerning his travels as well as anecdotes, historical information, and quotes from a variety of authors….. True to form, and indeed to the title of the whole, Rzewuski lavishes the most attention on Koheylan purebreds. The second volume is devoted entirely to all things equine, with Rzewuski discussing the genealogy of Arabian horses, their sub-breeds or strains, coats and colours, breeding, and hippological terminology. On another day, Professor Majda returned to give a short but richly illustrated talk about the Arabian horse in Polish painting. Professor Douglas F. Antczak, Professor of Equine Medicine, who has been on the scientific staff of the Baker Institute for Animal Health at Cornell University’s College of Veterinary Medicine in America since 1979, gave a really interesting overview of his team’s new research project on the genetics of the Arabian horse, sponsored by the Qatar National Research Fund, that may help to unravel the genetic origins and understand the special characteristics of the Arabian horse. 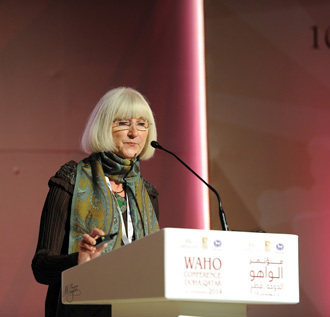 As Professor Antczak explained, this project arose from contacts made at the 2011 WAHO Qatar Conference: “My colleague Dr. Samantha Brooks, an equine geneticist and faculty member at Cornell University, was invited as a Guest Speaker to the WAHO 2011 Qatar Conference, where among other things she spoke about the genetic mutation that causes the lethal disease of Arabian horses known as Lavender Foal Syndrome. The identification of the mutation by the Cornell Equine Genetics Group resulted in a diagnostic test for carriers, which is now in use worldwide by breeders eager to eliminate this defective gene from the Arabian breed. That 2011 WAHO meeting provided an introduction to Arabian horse breeders from around the world for Dr. Brooks and myself. While in Qatar, we also established ties with scientists at the Weill Cornell Medical College in Doha, an affiliate of the Cornell Medical College in New York City. That in turn resulted in the successful grant application to the Qatar National Research Fund (QNRF) to study the genomes of three keystone mammals in Qatar: the Arabian horse, the Dromedary Camel, and the Arabian Oryx. The project is now underway. 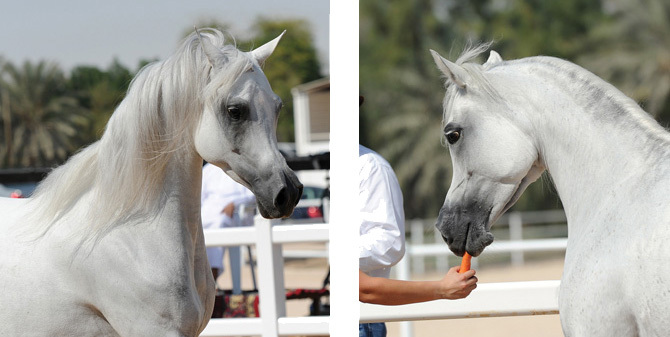 “The Arabian horse component of this new QNRF project is aimed at answering two key questions about the Arabian breed. 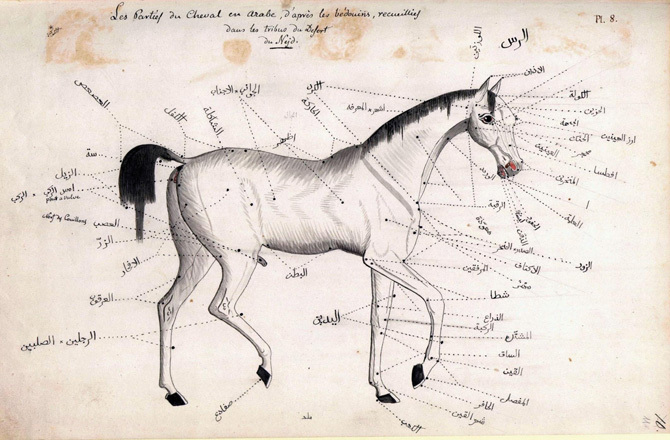 First, how distinct is the genome of the Arabian horse? 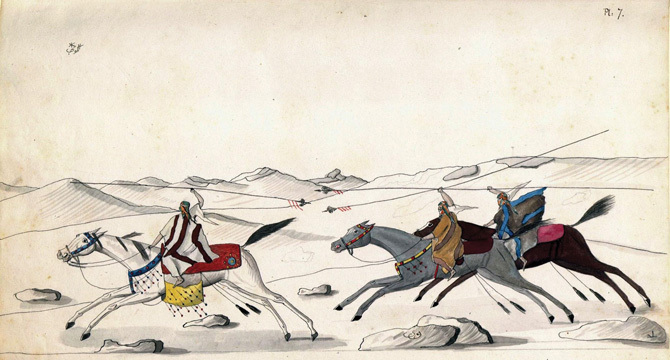 From recent genome-level studies that have compared various horse populations we know that the Arabian differs from all other breeds, but the level of resolution of those studies was low. 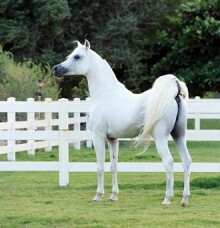 The individual genes that distinguish Arabians from all other horses have yet to be identified. 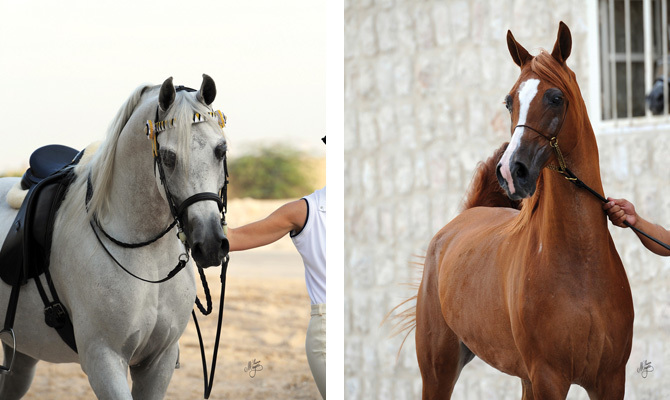 Second, how variable are Arabians within the breed? For example, do the lineages of Arabians used for show, endurance, or racing differ from one another in terms of their genetic make-up? 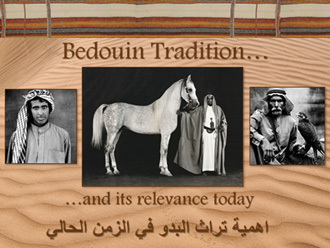 What is the contribution of the Desert Bred horses to today’s Arabians? By studying the genomes of various lines of Arabians, we may be able to determine the answers to these questions and to address deeper issues such as the genetic mechanisms that have enabled the Arabian horse to thrive in desert conditions. Finally, it may also be possible to discover how the Arabian breed originated from the ancient horses of the pre-historic era. “The resources and techniques developed as part of the international Horse Genome Project now enable equine geneticists to tackle such questions in ways that were unimaginable only a few years ago. Equine geneticists at universities and research institutes around the globe have been successful at identifying diseasecausing genes for several devastating conditions, genes that determine coat color, and a small number of genes that influence performance-related traits such as speed and gait. Elimination of disease-causing genes from horse populations through genetic testing and selective breeding can result in the production of healthier offspring and enhancement of the welfare of the horse. On the other hand, selection for desirable traits such as coat color and performance can now be accelerated through the use of genetic markers. Professor Antczak also told us about some recent and ground-breaking research papers, one of which described some analysis of 25,000 year-old horse DNA which showed that some of the coat colours of these ancient horses were the same as modern horses have today, including the spotted coat pattern of the Appaloosa, which was very unexpected. He also told us about an even more remarkable paper on the evolution of the horse and the horse family, published in 2013, on DNA taken from a horse that lived 750,000 years ago in the northern regions of Canada and Alaska. This is the oldest genome sequence of any animal ever sequenced, and it is the horse. One of the findings showed that, when compared with the sequences of other known horses and the donkey, the separation time in evolution between horse and donkey, and Przewalski’s horse, was about 4 to 4 1/2 million years ago, which is longer by about 2 million years than was previously thought. So it means that the common ancestor of the horse and the donkey lived further back in time than we thought before. All in all this was a most fascinating and thought-provoking talk, very well received by the audience. Dr. Jean-Louis Leclerc from France, a very well known equine veterinarian who has been totally involved in the sport of endurance for nearly 40 years gave a heartfelt talk on a currently very hot topic, based on his many years’ experience at the top levels of the sport, on how best to improve the welfare of endurance horses in competition and training. He addressed issues such as better training of officials, better enforcement of the rules, and better education of riders not only in their riding ability but also in their knowledge of the physiology and needs of endurance horse. In his conclusion, he said this: “I am convinced that the protection of horses and their welfare in endurance will be possible only with the implementation of a compulsory education of the riders, also of the trainers, concerning the riding techniques, training, feeding, basic knowledge about horses in particular about physiology of the effort so important in endurance. We have to remember that the rider is his own judge on the track during a competition. Without basic education how can a rider judge himself? He has to have a minimum of compulsory knowledge. “The Officials have a very important role during competitions. Their education should not be limited to an amount of knowledge acquired but extend to “how to use it”. Knowledge, behavior, authority, ability to manage a team, leadership are the qualities they must have and use to ensure a good and safe progress of the races. Finally I would like to insist on the role of the National Federations who are in charge of the behavior of their riders and of the protection of the horses in their own country. They have a fundamental role in the education, training and control of their riders. Assuming that purpose, they have a large responsibility in the protection of the horses in all disciplines, and particularly in endurance. Two leading French researchers, both specialising in equine behaviour, organised complementary and thoughtprovoking lectures. Dr. Martine Hausberger, Director of Research at the French National Research Center in the Human and Animal Ethology Unit of the University of Rennes, spoke about the human-horse relationship in her talk “How Our Perception of Horse Behaviour Affects Their Welfare”. Her colleague Dr. Clémence Lesimple, from the same University, then covered the important topic “Improving Horses’ Health And Welfare Through Adapted Management Practices”. “Going forward, towards solutions to improve horse welfare, it is also necessary to think about our own beliefs and actions….. So we became interested in comparing positive and negative reinforcement, not only in terms of performance because we all know they can learn both ways, but what impact does this have on our relationship with horses, this was our real question. So we made an experiment, where we trained ponies to step backwards using a verbal command. They had to learn, after a while, that if we said a certain word they had to move backwards. For some of the ponies we used negative reinforcement, which was by agitating a whip in front of the pony, and for some we used positive reinforcement which was, as soon as the pony made any kind of movement backwards he got a food reinforcement. There were only 5 days of training, for 5 minutes, and after these 5 days of 5-minute training sessions, 100% of the ponies which got the positive reinforcement had learned the task, whereas only 50% of the negatively reinforced ponies did so. In Dr. Lesimple’s talk, which was also complex and wide-ranging, she highlighted a way we can improve horse welfare by trying to more closely mimic natural conditions, such as by simply reducing the time spent in individual stables and increasing the amount of time spent in social groups, out in paddocks for example, with free access to roughage such as grass or hay for much of the time. As she explained: “We did an experimental study, at the National Stud of Sidi Thabet in Tunisia using 44 Arabian mares without foals, that were housed in individual boxes at night and in a bare paddock during the day. They had hay at night, but none during the day. We found that during the day, the normal behaviours we would expect to see such as rolling, mutual grooming, and lying down resting, were not expressed. The main activity, 28% of the time, was spent in active locomotion, which is unusual, and they had fewer social interactions, the ones we did see were aggressive ones. We assumed that the lack of feeding activity during the day was implicated in these behavioural disorders. So we split 100 mares into two equal groups. The first had 50 hay nets, each containing 5 kgs of hay, hung at intervals around the fence. The control group remained on the same regime as before, they had the same hay quantity but it was not available in the paddock by day, they received it at night in their individual stables. And what we saw was that in the control group, which had no access to hay during the day, they did not rest lying down, they did not engage in mutual grooming, so there was very little positive social interaction. Whereas the group that had free access to hay in the paddock during the day, re-started normal positive behaviours such as lying down resting, and mutual grooming. They also showed an improvement in their physical condition, even though the mares in the control group had the same quantity of hay. Mrs Elizabeth J. Launder MSc, a leading equine remedial therapist from the United Kingdom who has spent her entire career, spanning 35 years, in the rehabilitation of horses, was equally interesting as she covered “The Rider or Trainer’s Influence, Negative and Positive, on Horse Performance”. Again, this was an excellent talk leaving the audience with much food for thought. Just to take a small example of what Elizabeth told us in her introduction gives an idea of the complex topic she covered: “Basic knowledge of anatomy and biomechanics is indispensable in the understanding of movement. It allows the rider, trainer and handler to be rational in preparing a work programme, in preparing a horse for the specific physical demands of a given equestrian discipline…..Given the different demands of the different equestrian disciplines, if you don’t understand them, if you don’t know what you are doing, you end up basically with a poor training regime. Poor training not only wastes the potential talents of the horse but predisposes it to injury. Improving the performance capacity of the horse requires the trainer to first identify what the horse’s individual qualities are, both anatomical and conformational and their emotional strengths and weaknesses. During the training of our horses, we are trying to compensate for any flaws by using their positives to eliminate their negatives where we possibly can. And so you have to develop your programme with these features of the horse in mind, so good riding and good training, as well as good management, can improve both the emotional health and certainly the physical health of the horse. But more particularly, it allows the horse to have a long term performance career. Last but by no means least, veterinarian Roland Owers, the CEO of World Horse Welfare UK, who is closely involved in this subject and especially in working with equine sport regulators, spoke passionately about “Horse Welfare: A Global View”. After an overview of the work of this major UK-based equine charity, and at the end of his talk, he said this: “Firstly, I hope you have understood the importance of having a strong voice speaking out for horse welfare. Horses have no voice, so we have to speak out for them. If we in this room don’t do it, then who will? Secondly, I hope you have learned a little about the work of World Horse Welfare and our practical brand of helping horses through working constructively with horses, as well as with horse owners, governments, sport regulators and other organizations to improve welfare across the full spectrum of the horse world. “Thirdly, we all have a collective responsibility to ensure the welfare of our horses is protected, no matter what our role is with them. You in this room are leaders who have the influence on how horses are treated and you have the power to show leadership on horse welfare. Just because something has always been done in a certain way does not mean it is always the best way for the horse. I hope we all take the welfare message into our experiences with these Arabian horses, and all our horses, and that we take them worldwide. The main WAHO General Assembly concluded with a spectacular Gala Dinner hosted by QREC, at which everyone agreed it had been a very interesting, productive and thought-provoking meeting. Everyone was eagerly anticipating the Pride of Qatar days which lay ahead. On Wednesday, we spent a fantastic evening at the spectacular Al Rayyan Racecourse, where the QREC hosted a dinner and several Arabian races under the floodlights, including two specific ones specially arranged for the WAHO Conference – the Jay Stream Cup named in honour of WAHO’s first President, and the WAHO Cup. There was also an excellent display of Arabian horses in traditional saddlery to enjoy. 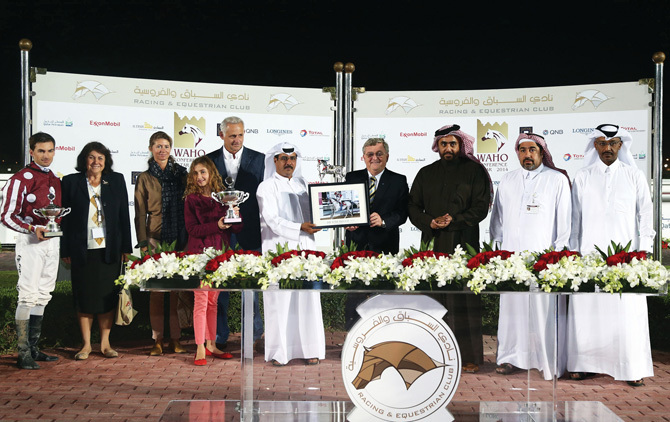 In the Jay Stream Cup, it was fitting that the winner came from Umm Qarn Farm of HH Sheikh Abdullah Bin Khalifa Al Thani, Patron of the 2014 WAHO Conference. His American-bred grey TM Thunder Struck (US) (Majd Al Arab / Bonnett) trained by Alban de Mieulle and ridden by Gaetan Faucon, posted a comfortable victory, galloping on resolutely in the home stretch to come from mid field and pass all the top contenders in full flight. The winners of the evening races: TM Thunder Storm (left) and Askhal. He won by one and a half lengths from Tuyoorna (QA) (Al Mudaffar/Mari Chou). Aziz Al Shahania (GB) (Prince D’Orient/Baldora De Brugere) finished third, beaten only a neck, ahead of Al Majd (QA) (Hafid Du Bac/Al Naama) taking fourth place. The award was presented to the winning connections by the newly elected WAHO President, Mr. Peter Pond, together with his wife, Jenny. In the WAHO Cup, run over 1800 metres, the bay Ashkal (GB) (Manifik / Ba’scherit), owned by Jassim Mohammed Al Badi, came through with a brilliant burst of speed in the final furlong to take the prize. 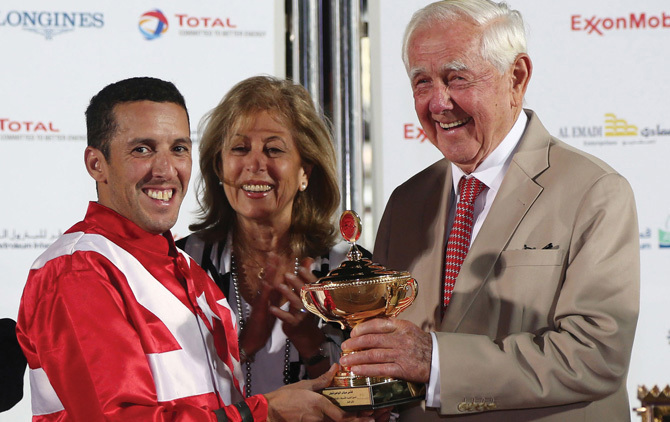 Trained by Jassim Al Ghazali, Ashkal was ridden to victory by Yanis Aouabed. 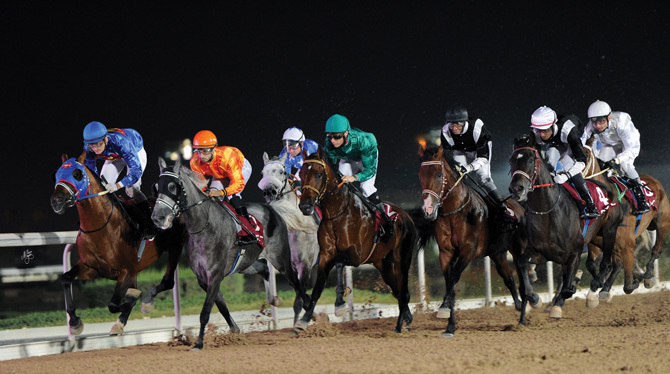 Maazouz (QA) (Amer / Khawater) clinched the second place ahead of Al Khattaf (GB) (Amer / Aziza D’Aroco). At the prize-giving ceremony, the award was presented to the winning connections by WAHO’s President Emeritus, Dr. Hans-J. Nagel, with his wife, Nawal. TM Thunder Struck winning group with WAHO President Peter Pond. On Thursday afternoon, we had an invitation to visit one of the world’s great Arabian breeding establishments, the famous Al Shaqab, Member of the Qatar Foundation, which encompasses a riding academy, Qatar’s National Endurance Team’s stables and training centre, veterinary facilities and of course its core activity, the Arabian horse breeding and showing section. 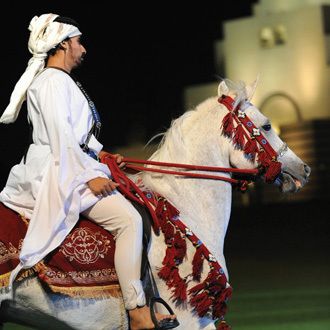 Al Shaqab is not just a stud farm. 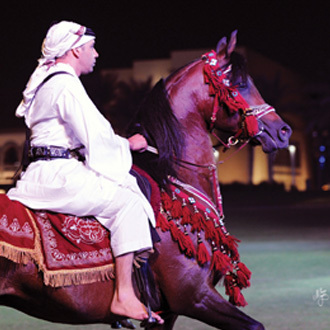 It is an educational resource and a community facility and their mission is to become global leaders in preserving, improving and promoting the Arabian horse breed and maintaining accessibility to the community while setting the highest standard in breeding, showing, equestrian arts and equine welfare. Following a tour of the facilities and plenty of time to wander through the barns, we were treated to a parade of 22 of their most promising youngsters from world-class mares. 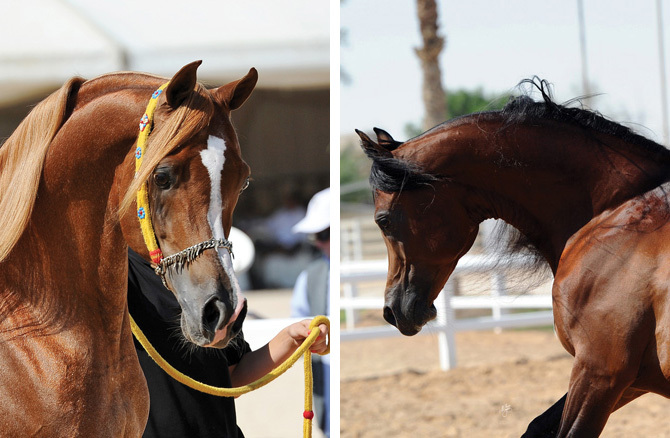 Their sires were Farhoud Al Shaqab, Fadi Al Shaqab, Wadee Al Shaqab, Kahil Al Shaqab, Al Adeed Al Shaqab and Marwan Al Shaqab. 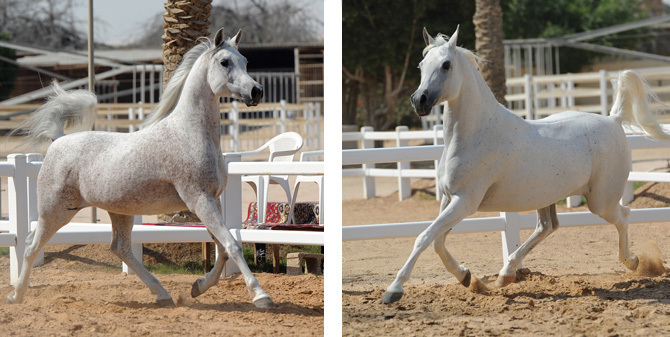 Many of these young horses represented several generations of Al Shaqab breeding. Their most famous breeding stallions were mostly out of the country on breeding duties elsewhere, but a highlight for many was seeing former World Champion and sire of champions, Al Adeed Al Shaqab. Even at 19, and despite the loss of an eye, this ethereal white straight Egyptian stallion just takes your breath away! Several of those shown represented several generation’s of Al Shaqab’s breeding programme, such as the good moving grey yearling filly Kawkeb Al Shaqab (Farhoud Al Shaqab/Soundous Al Shaqab), the impressive bay yearling filly Aswar Al Shaqab (Kahil Al Shaqab/Hathfa Al Shaqab) and the delightful bay 6-month old bay filly, as yet un-named, by Wadee Al Shaqab out of Magheeda Al Shaqab. Another crowd-pleaser was the gorgeous bay 2 year old filly Kahla Al Shaqab (Marwan Al Shaqab/Aleysha Al Nasser). A particular favourite for everyone was the charming filly foal by Kahil Al Shaqab out of QR Annah Ferrari, she was only a week old but seemed to enjoy showing off for her first ever audience. Our thanks go to Mr. Mohammed Al Sulaiti, Manager of the Breeding & Show Department and his team for arranging such a wonderful parade, and for the delicious dinner we all thoroughly enjoyed, before heading back to our hotels. Qatar’s breeders have a passionate commitment to the Arabian horse and during the Pride of Qatar Days, which followed the main Conference, we were treated to four incredible days visiting some of the country’s premier studs. We were privileged to see Arabians at Al Samariyah Stud, Al Shahania Stud, Al Nasser Stud and Umm Qarn Farm. 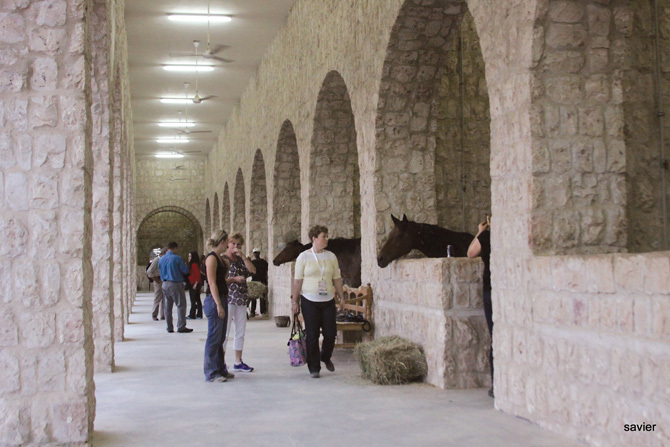 Those who were lucky enough to visit Al Wabra Wildlife Preservation also saw the lovely horses at Al Maha Stud. 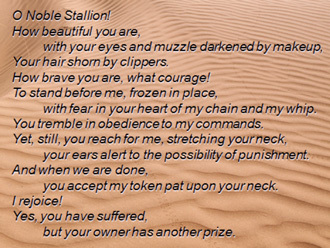 The show and breeding horses we saw were very beautiful and exuded Arabian type in abundance. For many, it was also a chance to learn more about the bloodlines of Qatar’s superbly athletic Arabian racehorses, universally acknowledged as some of the best in the world. The first of our several specially arranged studfarm visits was to the Al Samariyah Stud of Sheikh Faisal bin Qassim Al Thani, whose Museum we also visited separately. 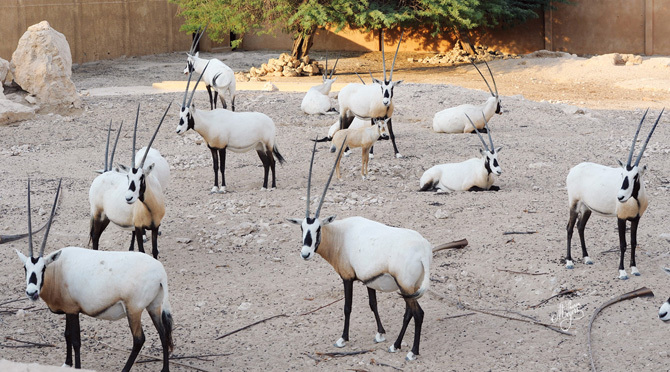 The Sheikh also maintains a breeding group of Oryx. The airy stables at Al Samariyah are laid out around a large traditional courtyard, in keeping with the other buildings on the site. Riding is very much a feature of this farm, with a riding school offering lessons both for children and adults, of course using mainly Arabian horses as the mounts. Here we were presented with an excellent group of Arabians exhibited under saddle and in-hand from both Al Samariyah and Al Gharafa Studs, the latter is owned by Sheikh Faisal’s brother HE Sheikh Hamad Bin Qasim Bin Faisal Al Thani. Many of their horses have competed successfully in endurance, racing and at shows both in-hand and under saddle. Among the horses shown to us were the excellent broodmare and successful ridden show mare Naama Al Shaqab (Sabiell / Biriusa), her son Ibn Naama Al Shaqab by Al Adeed Al Shaqab, and her grand-daughter Eftikhar Al Itihad (Ashhal Al Rayyan/Entesar Al Shaqab). (left) Eftikhar Al Itihad and (right) Ohio with Ben Pullen in the saddle. Top quality ridden stallions such as Ohio (Ras El Jadi/AZ Enigma), Judals Oasis (Qamar El Dine/TFA Mira), Fouad Al Gharafa (Marwan Al Shaqab/Al Jazia Al Oula) and Fadil Al Shaqab (Besson Carol/Abha Myra) were shown under saddle. Also in the lineup was the delightful Polishbred mare Elmina (Harbin/Elzunia), along with her look-alike daughter Elodia by Esparto. 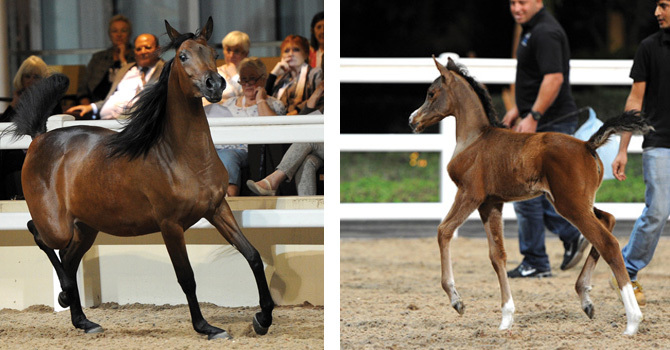 Last to be shown was the delightful recently weaned bay colt, Spartan Al Gharafa (Wadee Al Shaqab/Nooran Al Shaqab). For many of us, one of the real highlights was the visit to Al Nasser Stud, owned by HE Sheikh Nawaf Bin Nasser Al Thani and managed by Hendrik Mens, where we were treated not only to a lovely show of the farm’s best horses, but also a sumptuous lunch. 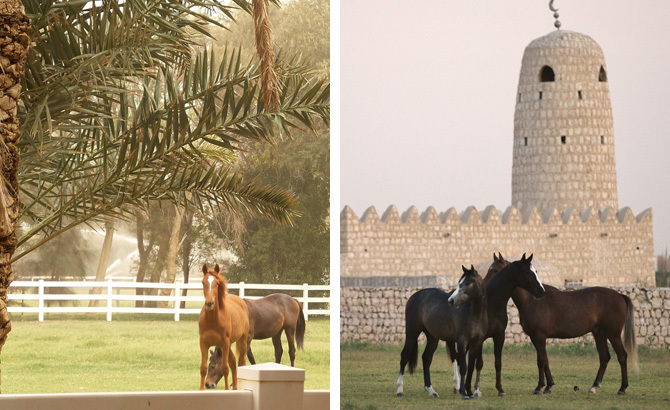 This is one of the oldest established farms in Qatar, with several generations of home bred horses of exceptional quality, including national and international show champions. Among the stallions on show were the striking chestnut Shagran Al Nasser (Ansata Selman/Dana Al Nasser) and the glorious young mahogany bay Ghazwan Al Nasser (Gazal Al Shaqab/Ftoon Al Shaqab), along with beautiful mares such as his dam Ftoon Al Shaqab (Al Adeed Al Shaqab/Malvina) and her delightful daughter Salsabiel Al Nasser by WH Justice. One of the crowd favourites was definitely Remal Al Nasser (Ashhal Al Rayyan/Aliah Al Nasser) with her charisma, chiseled head and good movement, all of which she is passing on to her foals, such as her outstanding daughter Rihab Al Nasser by Marwan Al Shaqab whose own daughter Bshair Al Nasser by WH Justice continues this lovely female family into the next generation. Towards the end of the parade another exquisite mare shown was the unanimous 2013 Qatar National Champion Mare, Anood Al Nasser (Ashhal Al Rayyan/Aleysha Al Nasser). 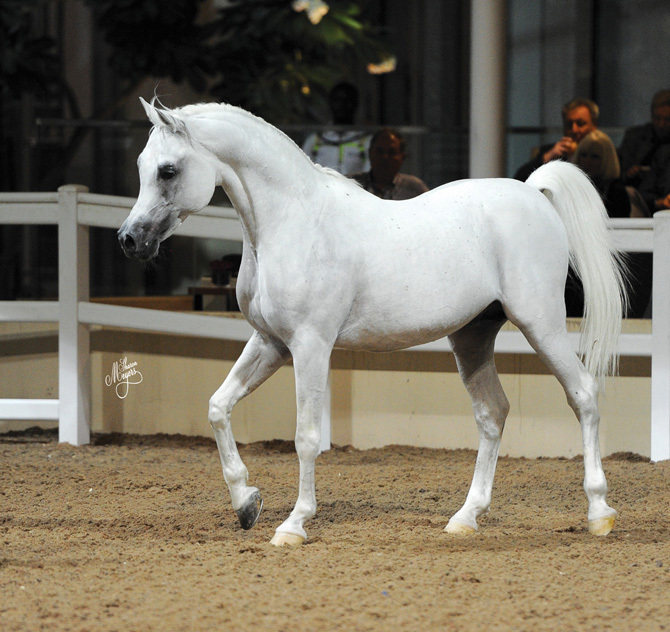 She is the dam of three foals and the last two horses paraded were her lovely fillies Najla Al Nasser (by Marwan Al Shaqab) and Najm Al Nasser (by ZT Marwteyn). Al Shahania Stud, the 600 acre farm owned by HH Sheikh Mohammed Bin Khalifa Al Thani and founded in the early 1990s, was another magnificent stud that we were privileged to visit. This incredible green oasis in the heart of the country has superb facilities for breeding, rearing and training horses. On arrival we were greeted by the management team who had arranged a wonderful visit for us. Bedouin tents made a picturesque backdrop as traditional craftsmen and women showed us their skills or explained some of the history of Qatar’s pearl-diving past. Also present were 2 charming camels offering rides which several people couldn’t resist, there were also sleek Saluki hunting dogs and falcons on show. A guided tour round the peaceful facility followed, past extensive grass pastures with youngstock playing, through palm groves with colourful birds flying overhead, through the equine swimming pool area and stables filled with friendly horses, all interested to meet their visitors. It was a moment of calm in an otherwise hectic few days. 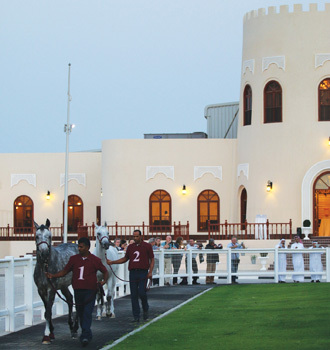 As evening fell, a select group of Al Shahania’s elite show and racehorses was presented, as deputy manager Dean Lavy and trainer Julian Smart proudly introduced some of the stud’s best breeding stock as well as some of their best current and potential future show and racing superstars. It was too dark for photography, but amongst those paraded around the central fountain were the handsome rich bay colt Murad Al Shahania (WH Justice/Abha Mudira), whose half-sister, Abha Qalams, was the first US National Champion for the stud. Stellar racing performers, many of them several generations home-bred with international Group I wins under their belts, certainly impressed the audience with their gleaming condition, rippling muscles and athletic good looks. Among them were the top rated mare Djainka Des Forges (Kerbella/Djamour Des Forges) and the farm’s home-bred 2014 WAHO Trophy winner, the grey stallion Assy (Amer/Margouia). A delicious dinner followed, in the same large courtyard, with several horses watching us in fascination from their stables. Everyone was given a special gift to take home as a memory of this unforgettable visit, just another example of the generosity and attention to detail which made every moment of the WAHO 2014 Qatar Conference and Pride of Qatar Days so very special. As a fitting end to the Pride of Qatar Days, our last stud visit was to Umm Qarn Farm, founded in the 1990s by the patron of the 2014 WAHO Conference, HH Sheikh Abdullah Bin Khalifa Al Thani. We were warmly welcome to the trophy-filled Majlis by General Manager Brigadier Abdulla Mohammed Al Yafaee and trainer Alban de Mieulle. From the upper floor, one can look down on a large stable complex, which was of course open for us to walk through and meet the horses. A guided tour followed, including watching a horse being exercised in the equine swimming pool, a horse being scoped in the veterinary area, and a chance to see some of the youngsters out playing in the extensive grass paddocks. This is a beautifully designed stud farm, with every possible facility for the horses’ wellbeing in place, where some of the world’s best Arabian racehorses are bred, raised and trained. One particularly friendly Arabian mare in the broodmare barn was the home-bred Al Zubarah (Amer x Al Jowharah), winner of 18 races including five Cup races in Qatar. Umm Qarn certainly has an impressive foundation of proven broodmares! A very well made film was shown on a huge screen outside, highlighting the many victories of Umm Qarn horses, both in Qatar and internationally. Finally, as the light was fading, a large number of Umm Qarn’s best breeding stallions and current horses in training were paraded, several of them representing more than one generation of the farm’s own breeding programme. As with the horses of Al Shahania Stud, this gave everyone a rare close-up glimpse of Arabian athletes of the highest calibre. During the parade we all enjoyed seeing TM Thunder Struck (US) again, the winner of the Jay Stream Cup, looking none the worse for his exertions on the racetrack a few days earlier. One of the eye-catching imports from Umm Qarn’s European breeding farms was the masculine grey stallion Al Tair (GB) (Amer/Altesse D’Aroco), this impressive grey stallion is definitely one of the prides of Umm Qarn farm, he is currently one of the top-rated Arabian racehorses in the world. The hospitality then extended to a sumptuous dinner and jazz concert. At the buffet, everyone loved the quirky fruit figurines and horses sculpted out of watermelons. As we left, we were all given delightful mementos as a lasting reminder of this wonderful visit. Mention must also go to Al Maha Stud Farm, where Manager Mr. Ahmed Abdelhak was on hand to show off several of their lovely horses, which incorporates a number of different bloodlines and favours black Arabians in particular, although they do have some spectacular greys as well. Al Wabra Wildlife Preservation is a special private facility dedicated to breeding endangered species, in particular animals from desert habitats, and they also have a breeding programme for the critically endangered Hyacinth macaw. We were all very shocked and saddened to learn that the owner of both Al Wabra Wildlife Preservation and Al Maha Stud, HE Sheikh Saoud Bin Mohammed Bin Ali Al Thani, passed away suddenly during the time we were in Qatar. Other activities included viewing the amazingly eclectic Sheikh Faisal Bin Qassim Al Thani Museum. You could easily spend days wandering through this extraordinary private museum, which also houses a large collection of traditional Qatari artifacts and a comprehensive collection of historic vehicles. We also enjoyed our visit to the new Al Zobara National Stud Farm which is under construction at the moment and will be capable of housing 600 horses. We also attended a wonderful Performance Show at the QREC where we saw two ridden classes, one each for mares and geldings/stallions. The horses were well presented and ridden, several of them are also past race winners or show winners. It was a joy to watch them and encouraging to see that a second career is available for the horses after they finish their more athletic endeavours. Winner of the Ridden Stallions & Geldings class, with 17 entries, was the grey stallion Fadil Al Shaqab (Besson Carol/Abha Myra), ridden by Clare Fitch. Second was the chestnut Spanish-bred Tolstoi Del Rey (Falco/Feijoa), ridden by Michelle Grimes and Ibn Naama Al Shaqab (Al Adeed Al Shaqab/Naama Al Shaqab) ridden by Sian Jones was third. Winner of the Ridden Mares Class was the lovely chestnut Elmina (Harbin/Elzunia), beautifully ridden by Sian Jones. Second was Eftikhar Al Itihad (Ashhal Al Rayyan/Entesar Al Shaqab) with Megan Jones and third place went to the age-defying 17 year old, Naama Al Shaqab (Sabiell/Biriusa) ridden by Clare Fitch. And of course no visit to Qatar would be complete without a visit to the camel races, in this case specially laid on for our group by HE Sheikh Hamad Bin Qasim Bin Faisal Al Thani, Chairman of the Camel Racing Committee. 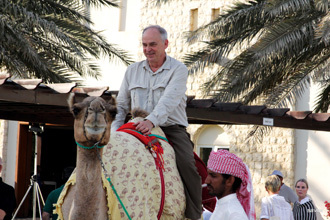 Camel racing is extremely competitive in Qatar and many of them are worth millions of dollars. Robot jockeys are used by the owners/trainers who control their galloping camels from the fleet of 4x4s that thunder alongside the camels. Racing along with these vehicles is not for the faint hearted as camels can gallop up to 65 kilometres per hour! Thrillingly, our large bus sped along with the melee of cars following the camels, it is an experience not to be missed, if ever you have the chance! Another rare treat was a very special visit to the private Camel Farm of the Emir of Qatar, HH Sheikh Tamim Bin Hamad Al Thani. 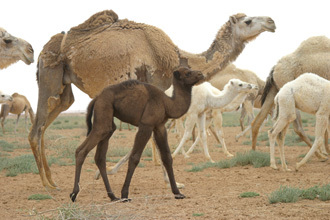 Here we learnt there are many breeds of camel, each having distinct characteristics according to whether they are used for milking, working or racing. We watched an exciting demonstration camel race specially laid on for us, which was as thrilling as always. We also visited the well-appointed Leawaina Camel Hospital, where they have the most up to date facilities to treat sick camels. This was followed by a delicious lunch generously provided by our host in the desert setting, after which many of us took the offered chance to have a ride on one of the gentle and beautiful camels. Pre and Post Conference tours were also arranged. The Inland Sea retains its magnetic appeal as a must-see place to go, as does the attraction of a few hours spent exploring the bustling Souq Waqif, or savouring the extraordinary collection at the Museum of Islamic Art, or wandering the wide streets of Katara Cultural Village. A special Photographic Exhibition was laid on for us there, by the Qatar Photographic Society, highlighting equestrian subjects in particular. Other less well known sites were also included, there really was something for everyone to enjoy. Apart from the justified fame of their Arabian horses, the people of Qatar are deservedly renowned for their hospitality and we certainly experienced this in generous measure from the warm welcome extended to us by the Qatar Racing and Equestrian Club, and by all the owners and managers who hosted our many visits to so many interesting places. We extend our heartfelt thanks to them all. 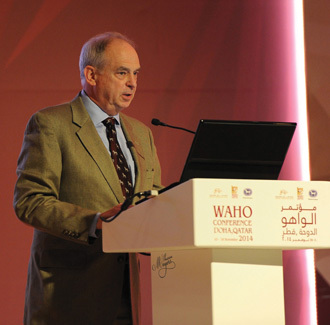 WAHO is a multicultural organization and these conferences are vital for the wellbeing of Arabian horse communities and registries worldwide. Not only that, they are educational, fun and you get the chance to meet fascinating people from all over the world, experience different cultures and see amazing horses. Do come and join us for the next WAHO Conference, scheduled to take place in the Kingdom of Bahrain in 2017. 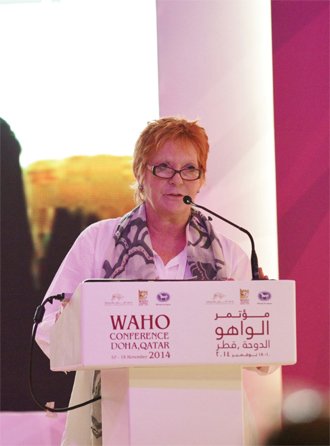 WAHO EXTENDS ITS SINCERE THANKS TO ALL THE FOLLOWING PEOPLE, WHOSE GREAT EFFORTS, HARD WORK, EXCEPTIONAL GENEROSITY AND WARM HOSPITALITY ALL COMBINED TO MAKE THE 2014 WAHO QATAR CONFERENCE SUCH A RESOUNDING SUCCESS. And all the support staff from QREC and all the hostesses. HOSTS & ORGANIZERS OF SOCIAL EVENTS & OF VISITS TO STUD FARMS. Mr. Mohamed M. Al-Sulaiti, Manager, Breeding & Show Dept. Mr. Majid Al Kaabi, Assistant Manager Breeding & Show Dept. 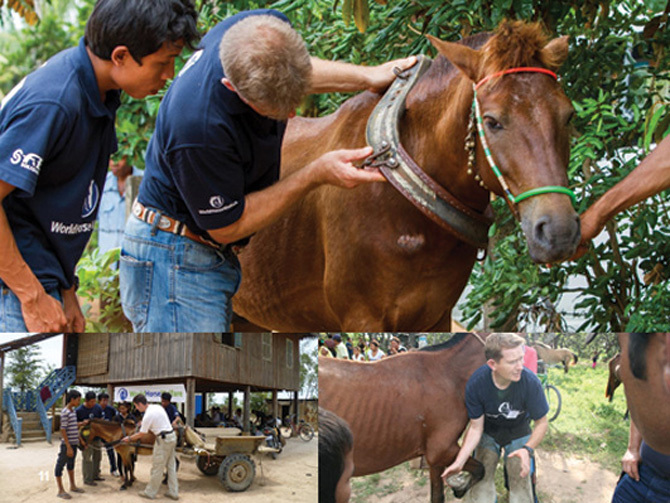 We also thank all the veterinarians, staff, handlers and grooms at all the farms for their involvement and assistance.